NOTICE: Activation key must be used on a valid Steam account, requires internet connection. ABOUT THE GAMEDeadfall Adventures is an action-driven first-person shooter, spiced up with elements from action-adventure games. Become an adventurer, hunt for treasures, explore unknown regions of the world and rescue the damsel in distress from the clutches of enemies, both earthly and not-so-earthly… . Join James Lee Quatermain on his journey across the globe! The StoryThe year is 1938. James Lee Quatermain is a man of many talents, yet holding on to money isn't one of them. James is an adventurer by trade, just like his legendary great-grandfather Allan Quatermain. And he knows how to squeeze money out of this famous name of his, while at the same time despising it. Despising those who believe his great-grandfather's tales of the supernatural and those who make fun of them alike. Accordingly, Quatermain isn't all too keen on escorting Jennifer Goodwin, an US agent and former colleague of his, to an Egyptian temple structure in order to retrieve an ancient artifact - The Heart of Atlantis. Neither does he believe in the reputed invigorating qualities of this artifact, nor does he care the least that a division of the Ahnenerbe, the Nazi department specialized in the occult, is after The Heart as well. But life has its ways of changing one's perspective. Quatermain soon finds himself part of a hunt across the globe - from the stormy deserts of Egypt to the icy depths of the Arctic, and all the way to the steaming jungles of Guatemala. In long forgotten temple structures the thrill of the chase awakens the true adventurer in Quatermain, as he and agent Goodwin strive to be one step ahead of the Nazis and the Russians, one step closer to obtaining the Heart of Atlantis. And deep in these temples, where age-old guardians awake from their eternal slumber, James soon learns that his great-grandfather's stories are not as crazy as he had always believed. For all things live forever, though at times they sleep and are forgotten...KEY FEATURES Action -Adventure gameplay from a first-person perspective	Set in the Quatermain-universe, created by H. R. Haggard	Fast-paced action and intense, accurate FPS gun battles	Adventurer equipment: compass, treasure maps, notebook and flashlight – necessary to solve ancient puzzles, find treasures and even to defeat certain types of enemies Puzzles that encourage you to explore the game environment and interact with it	Environmental traps that can be used to eliminate enemies in many spectacular ways	Exotic, picturesque locations from around the world – Egypt, Arctic and forgotten Mayan ruins in the jungles of Guatemala Compelling story faithful to the spirit of classic action-adventure movies	1930’s setting, including detailed weapon designs	Unique adventurer-style multiplayer features and modes	SYSTEM REQUIREMENTS Minimum: OS: Windows XP SP3, Windows Vista/7/8 Processor: Intel Core 2 Duo @ 2Ghz / AMD Athlon 64 X2 equivalent Memory: 2 GB RAM Graphics: NVIDIA GeForce 9600GT / ATI Radeon HD 3830, 256 MB VRAM, Shader Model 3 Support DirectX®: 9.0c Hard Drive: 5 GB HD space Sound: DirectX Compatible Additional: Initial installation requires one-time internet connection for Steam authentication Software installations required (included with the game): STEAM Client, Microsoft DirectX, Visual C++ 2008 Redistributable, Visual C++ 2005 SP1 Redistributable	Recommended: OS: Windows 7/8 Processor: 2.6 GHz Quad Core processor Memory: 4 GB RAM Graphics: NVIDIA GeForce GTX 460 / ATI Radeon HD 5850, 1 GB VRAM, Shader Model 3 Support DirectX®: 9.0c Hard Drive: 5 GB HD space Sound: DirectX Compatible Additional: Initial installation requires one-time internet connection for Steam authentication Software installations required (included with the game): STEAM Client, Microsoft DirectX, Visual C++ 2008 Redistributable, Visual C++ 2005 SP1 Redistributable © 2013 by The Farm 51 Group SA, Poland. Developed by The Farm 51 Group SA, Poland. Produced, Published & Distributed by Nordic Games GmbH, Austria. 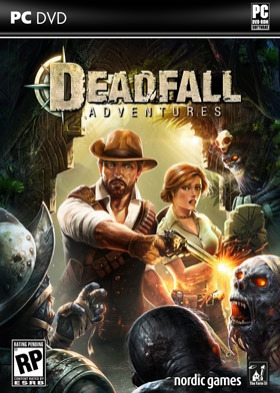 Deadfall Adventures is a trademark of The Farm 51 Group SA, Poland. All other brands, product names and logos are trademarks or registered trademarks of their respective owners. All rights reserved.